First, start by getting the approach right. It's better for your horse to come find you to be haltered if possible. Start by standing on the horse's left side. 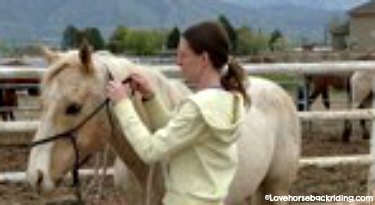 Take the longest single strap of the halter and bring it under his neck with your left hand and then reach over and hold it with your right hand so it looks like the picture. As you can see above, I am using the long strap to ask the horse's nose to come towards me. Then you will gently slide the nose piece up around his nose. 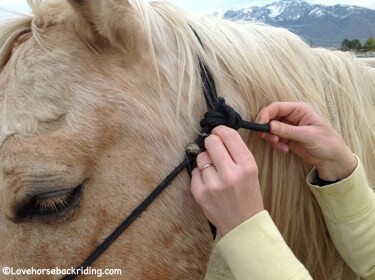 Do this by holding both sides of the halter as shown and slide it up towards his ears. 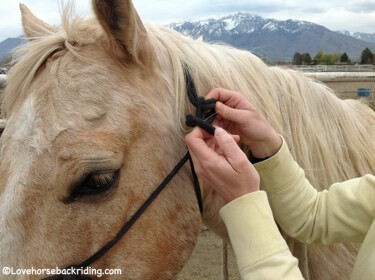 Once you have the halter on with the nose piece over the nose like above, you will take the long connecting piece that is on the right side and gently bring it up and over the neck to the left side, just behind the ears. Avoid flipping the strap across the top of the neck. This "smacks" and can be frightening to the animal. Take the long connecting strap that you just brought over his ears and thread it straight down through the connecter loop. If you have the buckle type, you'll buckle it now. 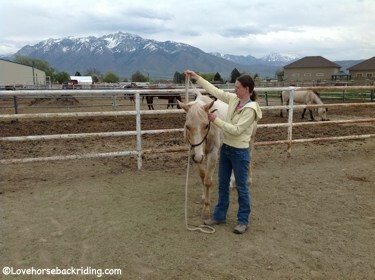 After you thread the long strap through the connecter side, you'll take the tail and make a "u", where the bottom of the "u" is towards your horse's tail like shown. Making your "u" around the upright connecter spot will keep the halter from sliding down as much. The last step is to bring the long end of the strap that was coming out by the eye, turn it back towards the tail, and thread it through the "u" you just made. Pull the piece you just threaded back towards the tail to tighten.